As usual, I had just gotten out of work and I was as ravenous as a gay man at Score on a Friday night. My friend had suggested trying out Egg & Dart and to be honest neither one of us had any idea it was a Greek restaurant. I was clumsily expecting omelets and other egg related delicacies. Instead, when we walked up we were greeted with the sign that read “Rustic Greek Cuisine” and all I could think was “Well I’ll be damned…” My friend and I were game so we walked in. We were so hungry they could’ve been serving brains on a stick and we would’ve given them a try. When we walked in we immediately realized we were the only people in the restaurant that weren’t employees. The place was completely empty; this was our first clue as to what was in store for us. 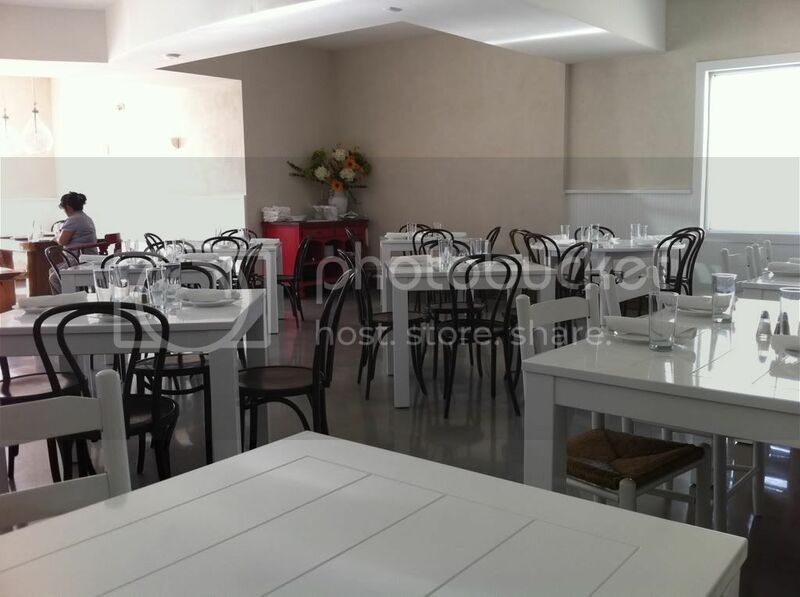 The restaurant’s décor was rather simple, all white with a few accents in varying hues of blue, nothing particularly exciting. 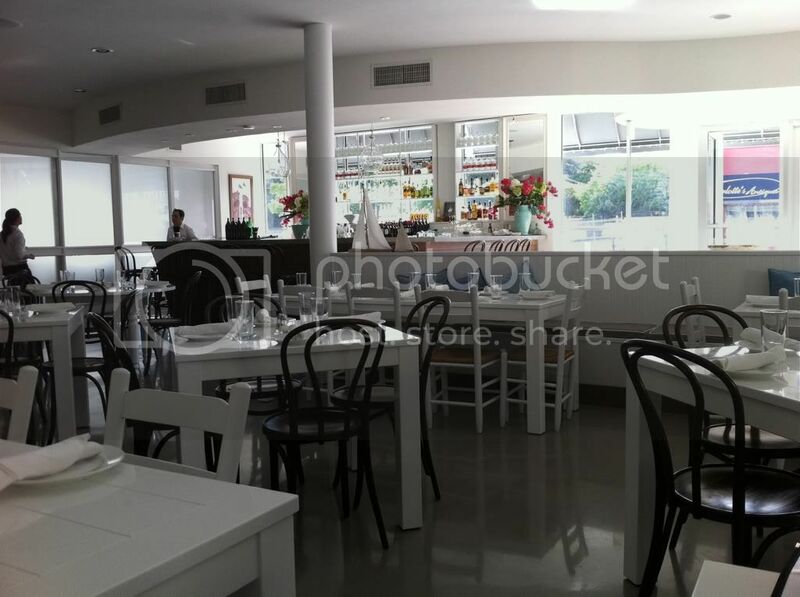 We had our pick of where to sit and our waiter was a middle-aged Greek man with a very thick accent. We ended up picking from their Miami Spice Menu and tossing in a couple of additional appetizers. 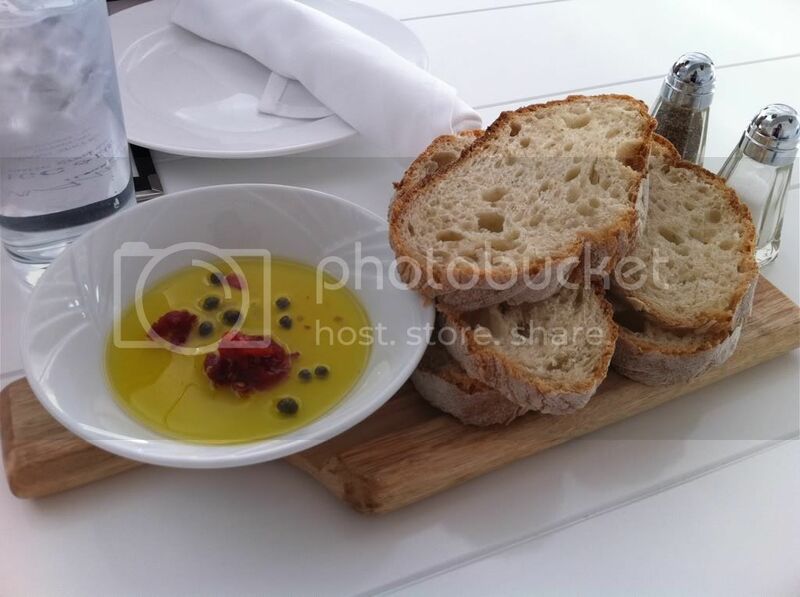 The first thing to hit our table was thick slices of Greek bread with a small plate filled with Olive oil, roasted tomato and capers. The bread wasn’t warm, but was relatively soft. Nothing extraordinary about it. Very soon after the bread came out, our hummus and tzatziki came out. Both the hummus and tzatziki came in small dishes with a spoon. We waited a while expecting pita bread to come any minute. Finally we waved our waiter down and asked if they had any pita bread, he looked at us like moronic wildebeests and said, “We do not serve Pita bread.” All I thought to myself was “WTF?! How does a Greek restaurant NOT serve pita bread? 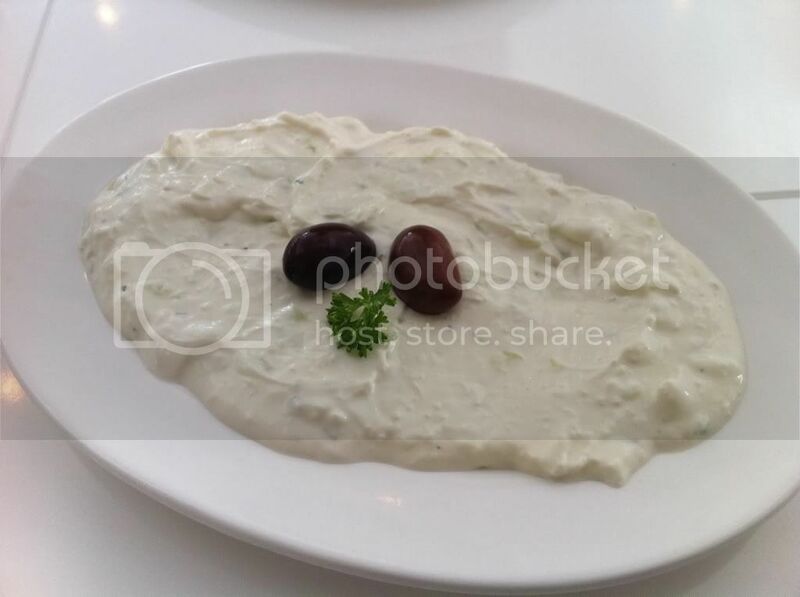 !” Our waiter said that the hummus and tzatziki is to be eaten with the Greek bread he had brought out earlier. 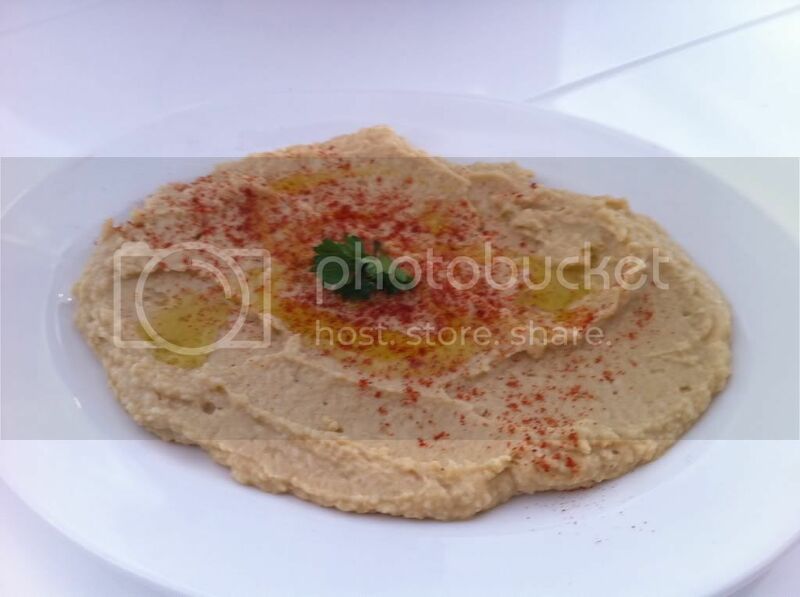 The Hummus lacked seasoning and all around flavor. On the other hand, the tzatziki was very thick and overflowing with flavor. The yogurt was slightly tart and the flavor of the dill and cucumber definitely shined through in a cohesive way. We didn’t get two bites of our hummus and tzatziki when our Miami Spice appetizers came, we had both decided to try their Avgolemono soup. 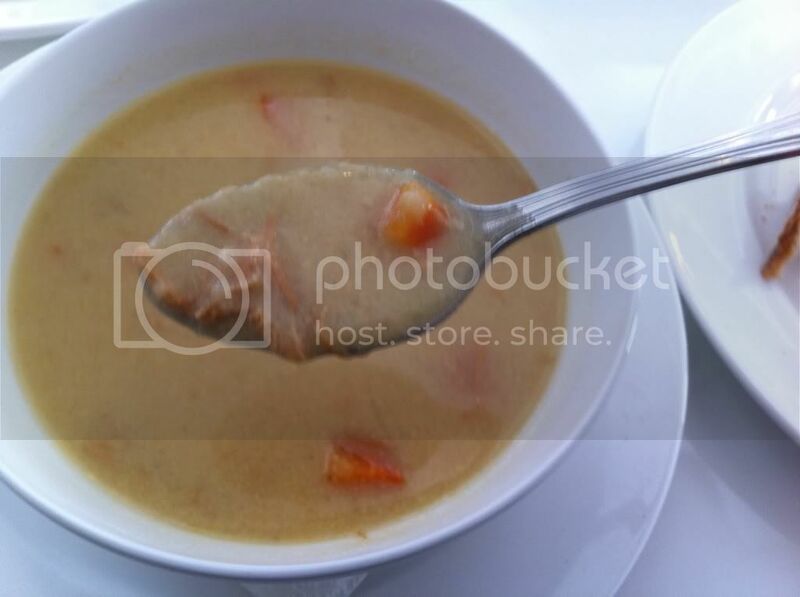 The soup also had a very sharp flavor with the taste of lemon, carrots and chicken beaming through primarily. Although the soup itself wasn’t very visually appealing, it was very flavorful. The flavor of the chicken and lemon infused stock went really well with the chopped carrots. This was actually one of the better dishes we had. I don’t know if our server was on speed that day, but again we didn’t get two bites in and our additional appetizers had come out. In hindsight, I realize we ordered way too much food, but oh well. 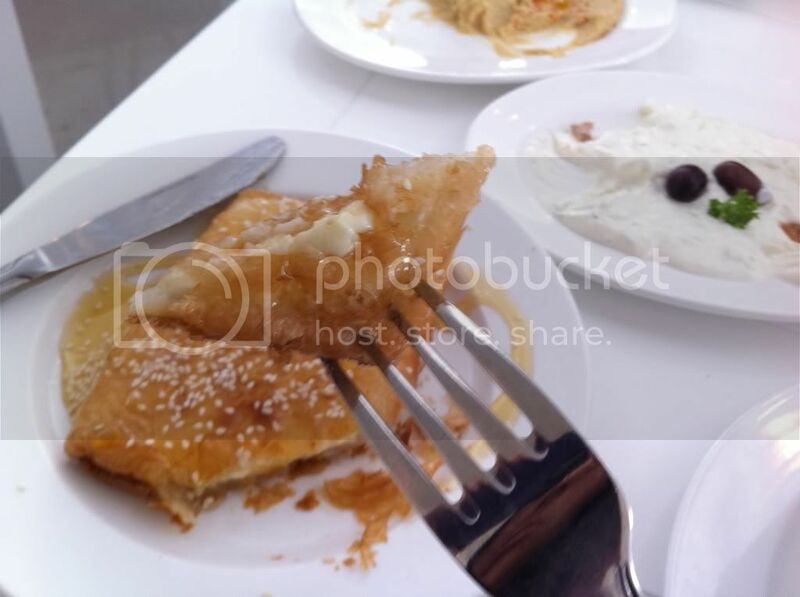 I had ordered their crispy cheese pie (think greek cheese pastelito) and my friend ordered their octopus. 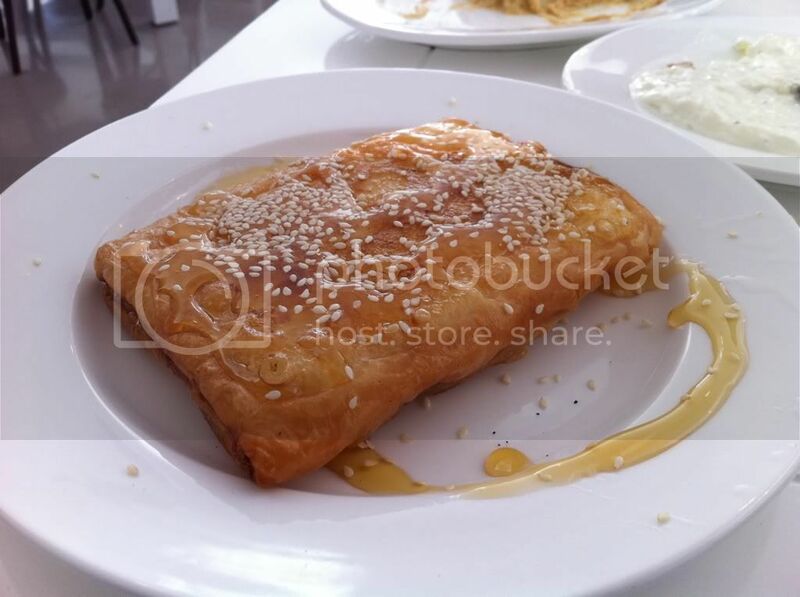 I really liked the crispy cheese pie, it’s phyllo dough stuffed with Feta cheese and sliced almonds and then honey drizzled over the top with sesame seeds. I loved the sweet and salty play on this dish. The almonds and crisp phyllo dough gave it a nice little crunch. The saltiness of the Feta was the total antithesis of the honey drizzled over the top. It was funky and I liked it. My friend’s octopus on the other hand, was way too salty for my personal liking. 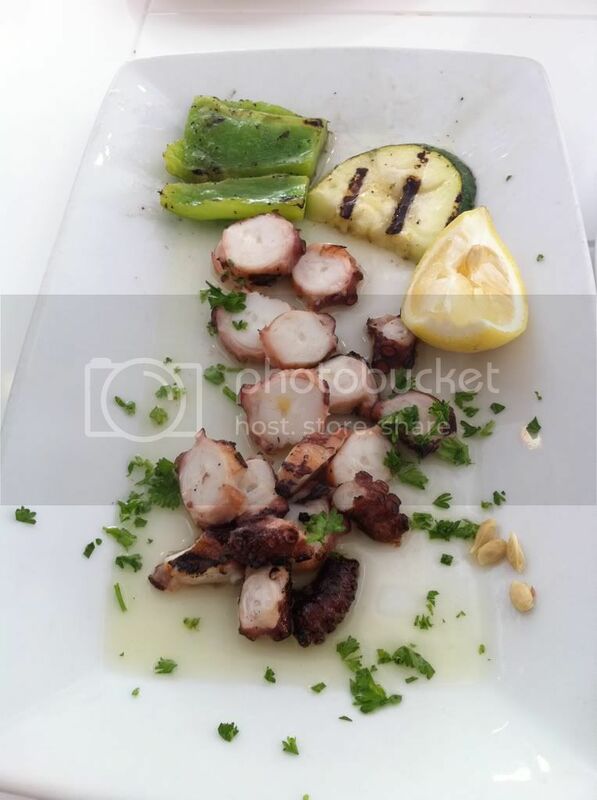 In addition, the octopus was slightly chewy and tough similar to a good year tire. Within seconds, our entrees were out and served. By the time I looked up our table was completely inundated with unfinished plates and food. Our waiter also noticed the plethora of food and dishes and like any authentic greek person (or Cuban abuelita) asked us “Ju no like!? Ju must eat if you like, yes? 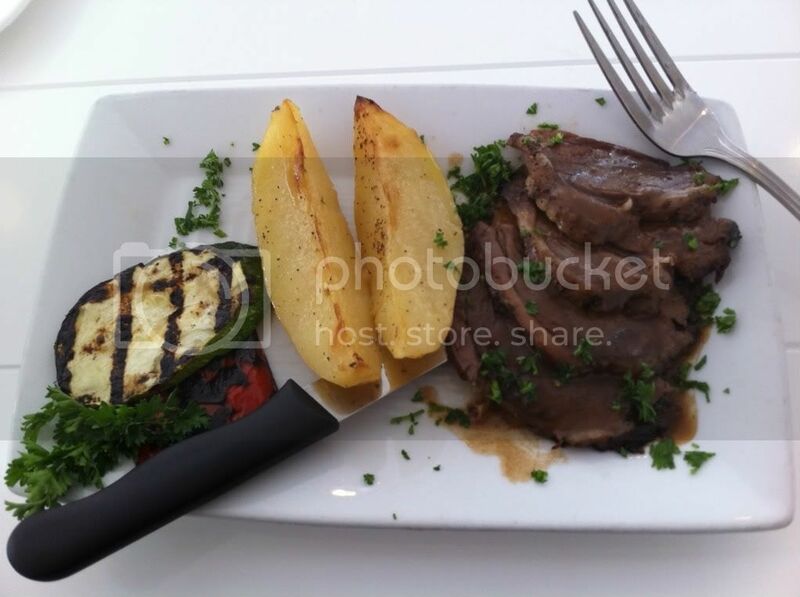 !” Both my friend and I had their Greek Lamb Kebab with lemon oregano potatoes. This dish was also a disappointment. The lamb was perfectly sliced, the meat itself had no seasoning what so ever and was very over cooked. The potatoes, on the other hand, tasted as if they had been soaking in lemon juice for days. I tasted no oregano on the potatoes, only the overwhelming lemon flavor that permeated through out the entire bite. The grilled eggplant was actually good and well cooked, but there was only one small piece given per dish. Yet another dish added to our never ending pile of unfinished food. Minutes later or desserts came out; I am not sure if they were in a hurry to get rid of us or if the staff really was on speed. None the less, by our third bite of our entrée our desserts hit the table. 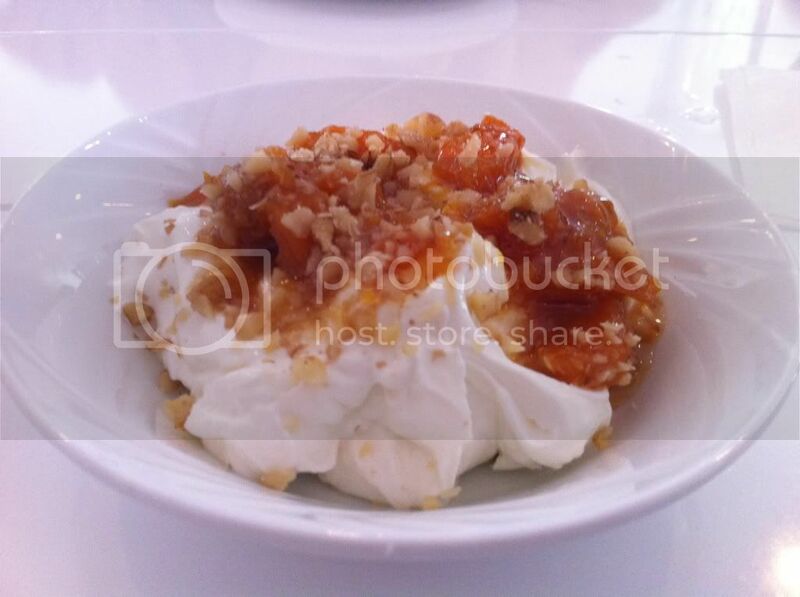 I had gotten their greek yogurt that came topped with honey, walnuts and apricots. 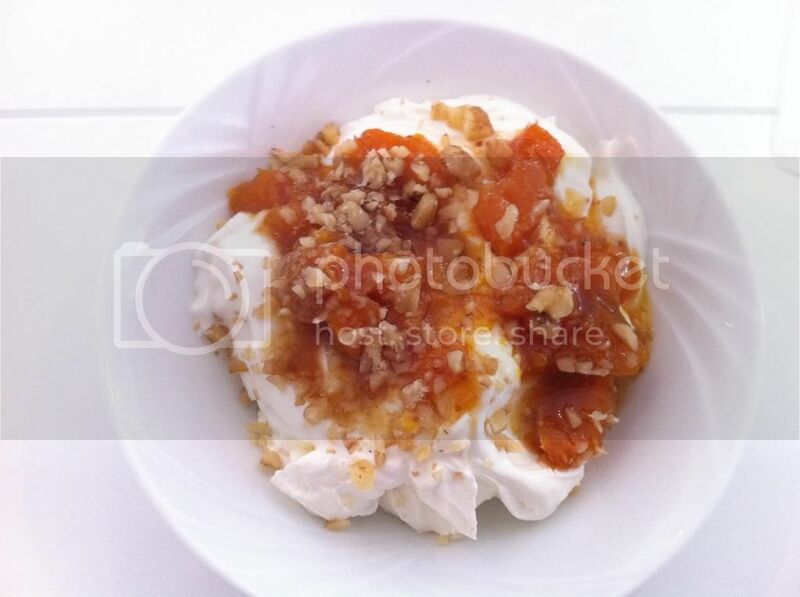 I actually really liked this, the yogurt was very thick and had a tart flavor that was down played by the apricots and honey. 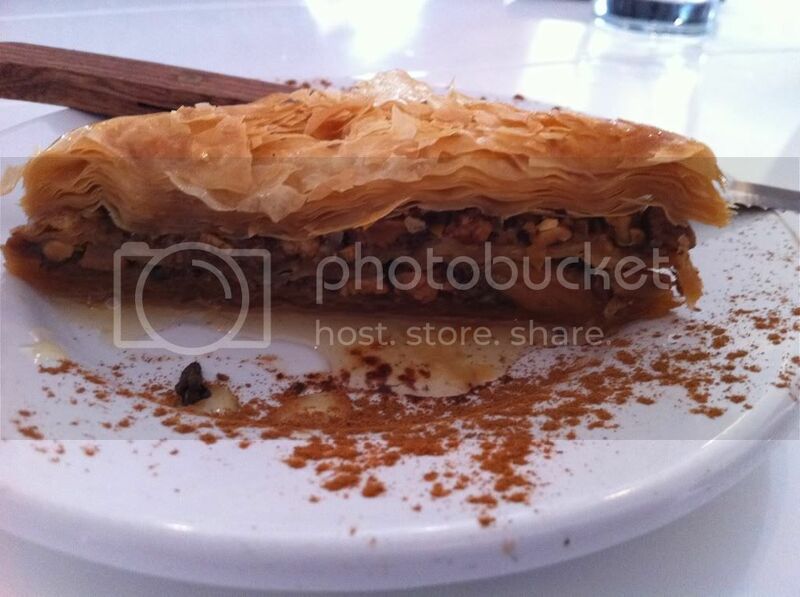 My friend got their baklava which was also good. It was pretty thick and we needed to use a fork and knife to cut through it, none the less the flavor was good. 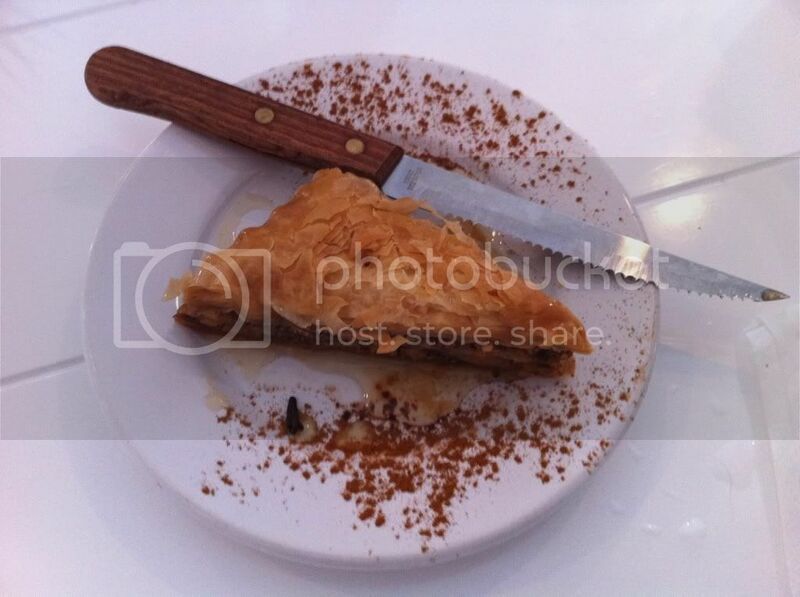 It wasn’t in any way unique, but it was one of the better baklavas I’ve had in Miami. Although there were some positive points in our meal, I have to say that Egg & Dart was an over all disappointment. For a restaurant that got an honorable mention in Miami New Times, “Top Five New Restaurants: Beyond Best of Miami” article, I definitely expected a bit more quality (and some damn pita bread!) Alas, you live and you learn. The potatoes and octopus sounds like one of those premade & stored indefinitely items that Gordon Ramsey discovers in Kitchen Nightmares!